Mermaids, sirens, nymphs swim amongst the colorful fish on this lagoon-like fabric. 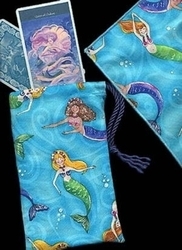 Schools of blue-toned fish provide the background - while the brightly-colored mermaids, accompanied by larger fish, fill the waters. 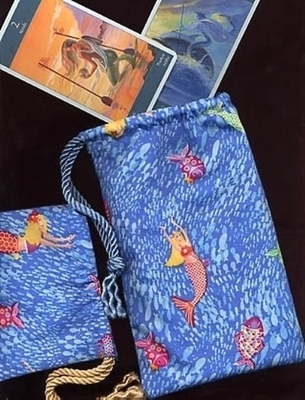 Such a fabric is ideal for a bag to store Lo Scarabeo's Tarot of Atlantis or the Tarot of the Mermaids (aka Tarot of the Sirens) or the Fantastical Creatures Tarot. 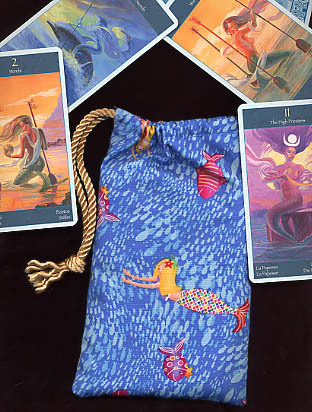 If you have this lovely new deck or just want a bag to represent the element of Water - then you'll find just what you need here.